Aloe Vera is one of the most famous herbal remedies that can be traced back to the 15th century when the Egyptians used it. It was offered as a sacrifice to the dead pharaohs. Traditionally, the plant has been used for many things including a balm to heal wounds and cure skin problems and was ingested to help with digestive problems. It is very popular today to treat sunburn and is one of the ingredients in many popular brands of after sun care, as well as skin care and beauty products for both men and women, baby care products and cosmetics. In the United States Aloe has also been approved as a natural food flavoring by the Food and Drug Administration (FDA). How is Aloe Vera Used? This plant has been widely in the traditional herbal medicine of China, India, Jamaica, Japan, Russia, South Africa, the United States and across Latin America. In modern times it is one of the most widely remedies in alternative and herbal medicine. The sap of the plant is used topically to treat a range of skin disorders from sunburn to herpes and psoriasis and studies have shown that the extracts have antibacterial and antifungal properties. It is also thought that, taken internally the gel helps conditions such as ulcerative colitis, indeed preliminary studies have supported this use of the plant. Taken internally, the gel has also been linked to improved blood glucose levels in diabetics and lower blood lipids in hyperlipiadaemic patients. According to wikpedia this plant has also been linked with acute hepatitis or liver disease as well as being used as an immunostimulant to fight cancer in domestic animals. Unfortunately, this has not yet been tested in humans. 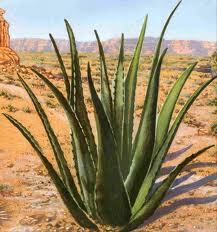 Aloe leaves contain a clear gel that is often used as a topical ointment. The green part of the leaf that surrounds the gel can be used to produce a juice or a dried substance (called latex) that is ingested. The product can also be applied neat to the skin to relieve burns, chaffing and blisters, sunburn, diaper and shaving rash. The product is commercially prepared for consumption or topical use in the form of gel, liquid and capsules and is used in a number of skin care products. It is not difficult to find testimonials to the efficacy of this miracle plant that has stood the test of time. There have been numerous double bind studies that have endorsed the traditionally held beliefs about this plant’s medicinal properties. Many different brands exist on the market, but one should choose carefully, because the quality of the aloe found in these different brands differs considerably. I recommend the number one supplier, forever which is a family run business that has been selling Aloe for a number of years.